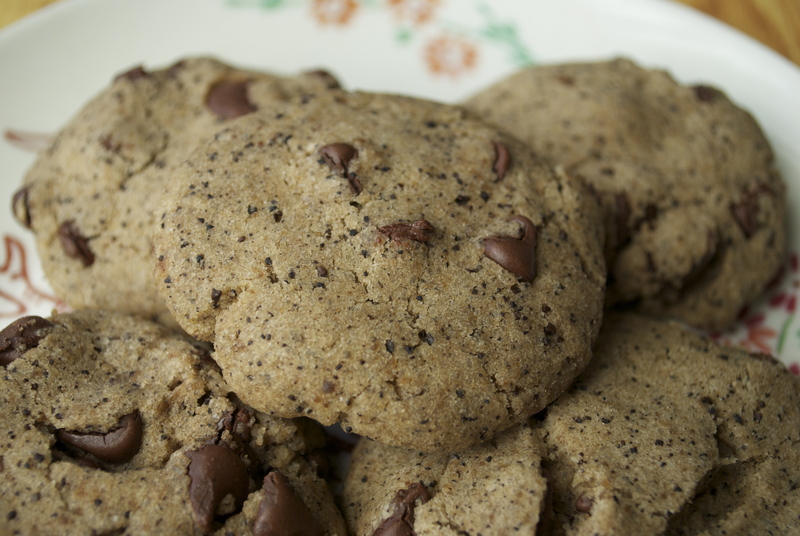 Kona Coffee Chocolate Chip Cookies. Let’s get one thing straight; I don’t drink coffee. Not because I don’t like it, but it gives me the shakes and keeps me awake and jittery. Bothers my stomach too. However, every now and then I like to enjoy a little coffee. I mean…literally a little because more than 6 ounces would destroy me. The Big Island of Hawaii is pretty famous for its Kona coffee. I haven’t been to the Big Island since I was little, but I remember my parents getting coffee in Kona and I remember it smelling really, really good. I decided I wanted some Kona coffee to incorporate into dessert and to make some homemade Kahlua with. I bought some organic medium roast Kona old style from Kuaiwi Farm. These cookies taste like those chocolate brownie frappuccinos that Starbucks used to sell. Preheat oven to 350°F and line two cookie sheets with a silpat or parchment. Combine the flour, coffee, and baking soda in a bowl. Set aside. In the bowl of your standing mixer, cream together the Earth Balance and both types of sugar. Add the Ener-G and vanilla, mix. Slowly add in the flour mixture and run the mixer until just combined. It may seem a little dry, but that is okay. It should stick together if you pick some up and squeeze it together. Fold in the chocolate chips. 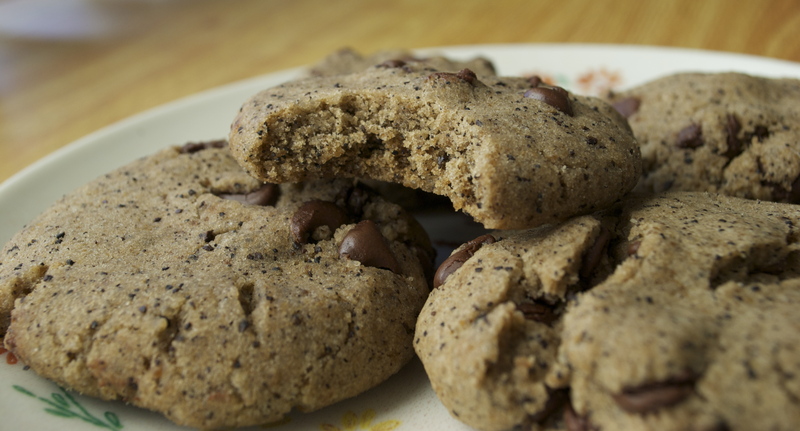 Dampen your hands and grab tablespoon size scoops of cookie dough and form them into cookies. Press them down just a bit as these are not really going to spread. Bake for about 12-15 minutes. 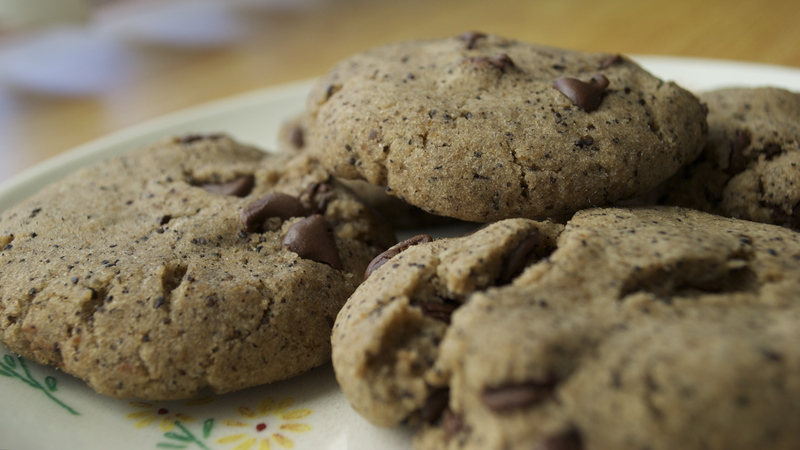 Cookies have a very tender, yet delicious crumb and lots of crunchy coffee ground bits creating a really lovely texture. ← Kalua “Pork” Jackfruit Quesadillas. We were recently in Hawaii bought a kona coffee chocolate chip cookie and kona ice cream. The cookie was thinner and darker and quite moist. It was yummy!